Please book your rowing lessons early to save an opening for you on our beautiful Adirondack shoreline and be prepared to enjoy the best individualized sculling instruction anywhere in the rowing universe! Since 1971, we consistently and without fail provide our customers with premium instructional sessions. Our affordable prices include value added items of a sculling DVD, sculling book, sculling manual and our awesome Adirondack Rowing T-shirt. Our Adirondack Rowing School is for individuals that are serious about learning the best sculling technique in a fraction of the time of the weekend or week long sculling camps. The Adirondack Rowing School is where you can learn the best sculling technique in the shortest amount of time while saving the most money. We are the oldest and the only rowing school in the nation where you can receive the best individualized rowing and sculling instruction with the most fun, courteous and skilled staff, while at the same time trying all the best open water rowing shells and sliding seat family boats side by side. As a result, every year our rowing school has grown due to our high quality one on one instruction and the unique provision of comprehensive product comparison. Because of this, we encourage individuals considering lessons or demonstrations to make reservations with us as early as possible. As summer gets underway in June, July and August, the rowing school is run daily and at times becomes difficult to schedule “drop-ins”; Although we try to accommodate everyone, it is not always possible. Our Rowing School is located in the Adirondacks, run April through November by appointment only. Learn to scull technically correct in the shortest period of time. Individual and small group lessons in the best technically oriented sculling styles. Sculling time in the best open water rowing shells in the world . . . side by side for immediate comparison. Services and products from North America’s oldest rowing shell dealer, Adirondack Rowing. Instruction is provided on the most beautiful of Adirondack lakes or even at your home, lakefront, or facility. DVDs are given with our paid lessons free of charge and are also available at reasonable rates. Great rowing T-shirts made of heavyweight pre-shrunk cotton to every rowing school student. A $100 check to you every time someone you refer to us buys a new shell package! Half of the cost of your school or demonstration fee refunded to you when you purchase any new shell package from us. Capped at $250 towards a new shell purchased. Discounts from lesson fees, discounts from demo fees and discounts from rental fees do not apply to the purchase of any used private or company rowing shell. These shells are already deeply discounted and cannot absorb further price reduction. We encourage individuals considering lessons to make reservations as early as possible. As summer gets underway in June, July and August, the school is run daily and at times becomes difficult to schedule “drop-ins”; although we try to accommodate everyone it is not always possible. Please see our weather app at the bottom of this page to check the current weather on Brant Lake. Novice lessons….$295 per person for a 2 to 2.5 hour novice lesson, $395 for a 2.5 to 3 hour two person novice lesson; $495 for a 2.5 to 3 hour three person novice lesson. Our novice classes teach the fundamentals of rowing. This “on the water” class will cover the elements of the technical sculling stroke, boat handling, water safety, rowing terms, and equipment care. 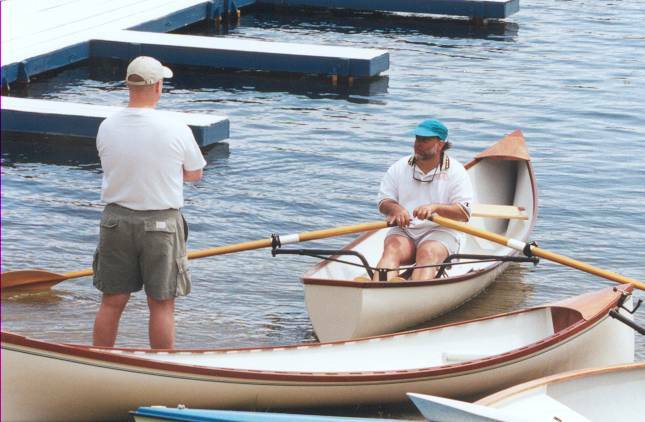 A variety of rowing boats, from Guideboats to shells, are used while learning the elements of the stroke, boat and equipment handling, and boat safety. At the completion of the class, you will be able to launch, scull and maneuver your shell with relative ease. Individual Instruction…. $150 per hour per person for the more advanced sculler looking for technical skill. $195 per hour for two person technical lesson. (50% refund if you purchase a new shell package from us!) We teach you more in less time than anyone. Kids age 13 and older can take an individual sculling lesson at the adult novice lesson price of $295 for two hours. Demonstration Time…….$75 per hour (completely refunded if you purchase a new shell from us at any time!) 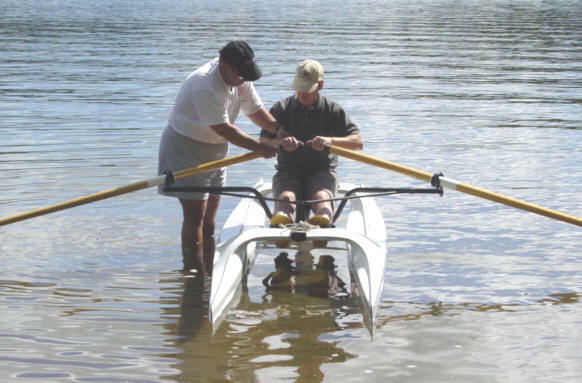 Demonstrations of shells are available ONLY when a rower has proven prior experience and wishes to try a single shell or various boats/shells in order to determine a suitable boat design for their abilities and needs. Off site instruction and demonstration……$795 for an onsite lesson for one person, which consists of a minimum of a two hour novice lesson. Mileage and travel time to your location are billed separately and in addition to the $795 on-site fee. Additional boats brought for the individual student or for additional people taught require an additional $125 per person, per boat. Maximum number of boats transported will be set at 4 boats unless requested well in advance. Boats that are of interest must be specified at the time the appointment is made. For a new one boat purchase and a novice or technical lesson in the boat purchased, pricing is $595 for the onsite lesson, plus mileage and travel time for onsite instructional service. If two or more new boats are purchased and novice lessons in the boats are also purchased then pricing is $495 plus mileage and travel time. Used boats purchased result in a reduction of the $795 onsite lesson fee to $695. All service requests must be accompanied by a non-refundable deposit before the boats are loaded. We invite you to compare our lesson rates to those of other sports. You could easily spend $400 on a ski lesson by the time you purchase lift tickets, rent skis, and pay for the lesson itself. We don’t charge for the use of our equipment, and you’re certainly free to use the lake as much as you want free-of-charge. We charge only for our instructor’s time and for our expense of renting the shoreline where we teach.